More spring snow, as several inches of accumulation will be possible throughout Monday morning. No fooling around — April snow absolutely happens in New Jersey! It occurs, on average, every few years. While I still wouldn't call Monday's winter weather event a "major" storm, there will be accumulation and there will be significant impacts on the morning commute. This will likely become our 16th snow event (with 2 or more inches) of the 2017-2018 winter season. Since I blogged Saturday afternoon, the forecast has trended slightly colder and a bit more convective. In other words, confidence is growing that we're going to see a period (however brief) of very heavy snow passing over the Garden State. Therefore, I've bumped up my snowfall expectations by a category or two. So instead of "an inch or two," it looks more like "two or three inches" for most of the state, with locally higher amounts. In order to offer a bit more specificity on this forecast, I've opted to draw a snow map after all. North of Interstate 195, overnight temperatures will be right around or just below the freezing mark — cold enough to sustain a period of all snow. One or two bands of very heavy snow will likely setup over this area of the state sometime Monday morning, leading to a quick 2 to 4 inches of accumulation. Road conditions and visibility may deteriorate rapidly in one of these heavier snow bands. Could we see an isolated total up to 6 inches? Sure. It would have to snow really hard though. On the flip side, in far South Jersey, don't expect much. Surface temperatures are still expected to be no cooler than 34 degrees. So it's a mostly rainy forecast — although, if there is a period of moderate to heavy snowfall, a healthy coating to maybe an inch may pile up on the ground. 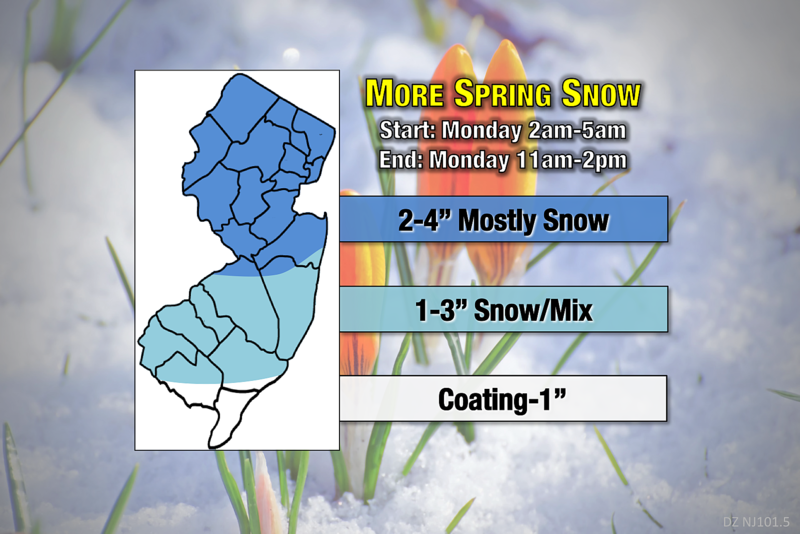 For the "in between" section of South Jersey, it's still going to snow and conditions will still be sloppy. However, I believe we'll see some mixing with sleet and/or rain in this band. In addition, the heaviest bands of snow area forecast to miss to the north. Therefore, I think 1 to 3 inches of snow is a prudent forecast here. Note: Most of the accumulations I've discussed here refer to cold, non-paved surfaces like grass, snow boards, cars, roofs, etc. Asphalt roadways — particularly those that are pre-treated with salt or brine — should remain wet and slushy, rather than icy and snowy. A Winter Weather Advisory has been issued for 18 of NJ's 21 counties, as of Sunday morning. "Advisory-level snow" used to refer to 3+ inches of snow accumulation. While that's a good possibility for much of the state, this advisory is more for the treacherous travel conditions expected Monday morning. This is a minor snowstorm. No bread and milk necessary. And there's no wind or coastal concerns, thankfully. However, as I mention often, it only takes a few snowflakes to completely snarl traffic and transit across New Jersey. Remember, it's not just about how much snow falls or how much sticks to the ground. The timing especially stinks this time around, with the heaviest snowfall occurring during the rush hour. Low visibility and icy/slushy/wet road conditions are going to be an issue throughout Monday morning. The good news is that a glimmer of sunshine and temperatures in the 40s are expected by Monday afternoon. I expect most (if not all) of the snow to melt by the evening's commute. Many NJ school districts are on Spring Break this week. Still, don't be surprised to see a spray of delays and closings on Monday from the schools that are in session. Sigh. Nope. We've got an active weather week ahead, with an almost-daily chance of rain showers. With below-normal temperatures expected through about the middle of the month, we have to keep snow chances alive for another couple of weeks.